GainSaver offers custom configuration options on all of our refurbished Mac laptops and desktops, as well as the refurbished PC systems we sell. The ability to have your refurbished Mac or PC custom configured by GainSaver technicians is a big advantage over buying new. GainSaver helps you get exactly the refurbished Mac or PC you want, and cannot get anywhere else. You can custom configure most of the critical components of your refurbished Mac laptop, desktop or PC right before check out using the GainSaver Configurator. This blog article focuses on hard drive customization. Why have GainSaver do the Custom Configuration? If you have the experience, the tools and the hard drive on hand, then you could install a different hard drive in your refurbished Mac after you purchase it from GainSaver. But there are many reasons to have GainSaver do it for you. Why go to the trouble of customizing your refurbished Mac laptop or desktop right after you purchase it? You refurbished Mac comes ready to use right out of the box. You'll save time and effort having GainSaver technicians do the hard drive upgrade for you. Even more important is the fact that you could have difficulties installing the new hardware. Don't take the risk. When GainSaver technicians customize your system, it is fully tested and the results are guaranteed. If there is a technical problem, we take care of it for you. If you buy another hard drive to replace the one comes with your GainSaver purchase, it will cost you more because you are paying for two hard drives – the one that is included in the base configuration, plus the second one you replace it with. The upgraded hard drive you select when you custom configure your refurbished Mac is already partially paid for. The base configuration includes a hard drive. So the cost of the upgrade is the price of the replacement drive minus the base configuration drive. 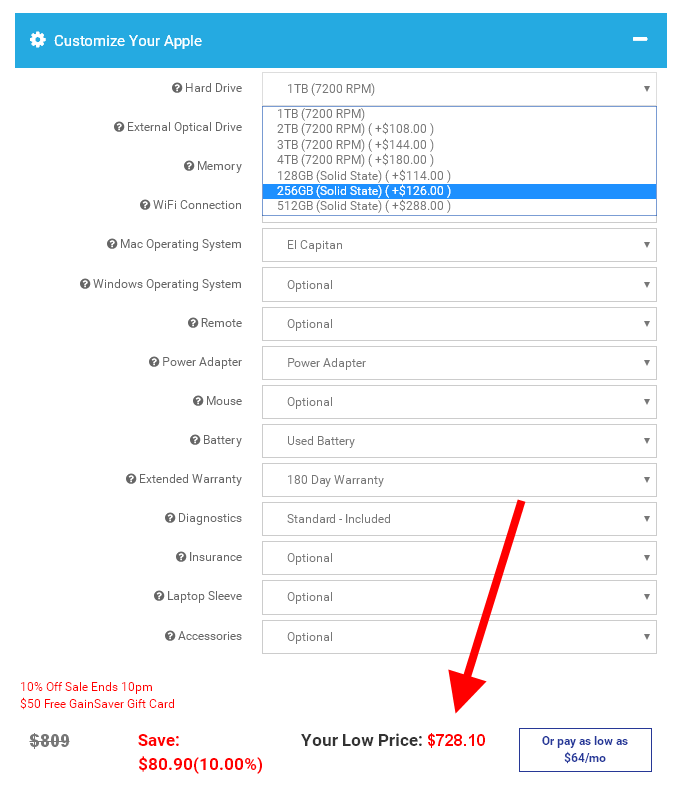 The specific hard drive types and capacities that are available in the Configurator depend on the specific refurbished Mac or PC you are looking at. This example is for an iMac that can be configured with either standard or solid state hard drives. There are two reasons to custom configure the hard drive in your refurbished Mac or PC when you shop from GainSaver. One reason is to increase data storage capacity, and the other is to increase the speed of your computer. If you need more room to hold your data files and application programs, then you'll want to use the GainSaver Configurator to have a higher capacity drive installed. Standard hard drives are cheaper per megabyte of storage, and they are available in much larger capacities that solid state drives. So a standard hard drive is probably what you'll want to get. Many older refurbished Macs are still perfectly suited for running all your applications. The only problem is that the hard drive capacity is a lot less than the hard drives that come with newer Macs. File sizes keep getting bigger, and even the Mac OS gets bigger every version. Macs that were introduced more recently may have a hard drive capacity of 500GB to 1TB to accommodate the extra files. There are 1,000 gigabytes in a terabyte, so a 1TB hard drive is twice the capacity of a 500GB drive. You can have GainSaver install one with twice the capacity, or even more. Depending on the refurbished Mac laptop you are shopping for, you can have a hard drive of 1TB or 1.5TB installed. Some refurbished iMacs and Mac Pros can be customized with a 4TB hard drive. Depending on the applications you will be using with your refurbished Mac laptop or desktop, system performance may be your highest priority. In that case, you'll want to upgrade to a solid state hard drive. A solid state drive has no moving parts, and works like regular memory. The difference is that a solid state drive retains data when you shut down the power. With a solid state hard drive, your refurbished Mac will boot up much faster than you are used to. And applications that access the drive frequently, like music production and video editing programs, will show the most improvements in performance. As solid state hard drives have become more commonplace, they have also dropped in price. 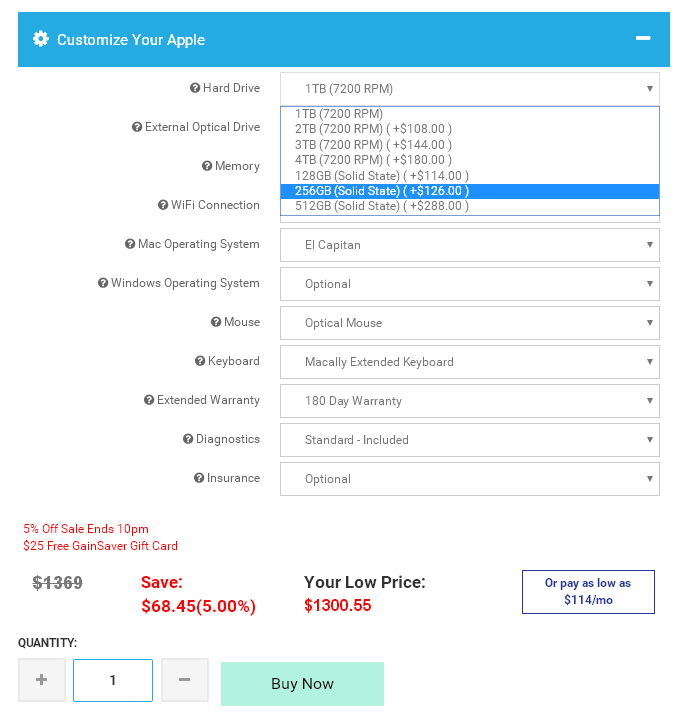 So even if the refurbished Mac laptop or desktop you are considering already comes with a solid state drive at the base configuration, you should look at the prices for high capacity solid state drives in the GainSaver Configurator. It might be worth it for you to upgrade to a bigger SSD drive if you have large amounts of data or plan to store a lot of music and video files on your refurbished Mac. Don't forget to Custom Configure! Before you click the Buy Now button to add your selection to the shopping cart, go through the options in the GainSaver Configurator. When you select different options, you can see the total price for the refurbished Mac or PC updated in real time. With custom configuration at GainSaver, you save money by upgrading only the components you really need, and not paying for extras that you don't need.